New developments have been improving the area around 60th and Market Streets. These developments are being spearheaded by community groups, and include housing and commercial development on both Market Street and the numbered streets of 59th, 60th, and 61st Streets. A new market-rate development at 6117 Market Street is being proposed by a private developer, S8 Investments, and designed by Harman Deutsch Architecture. This new development will face Market Street, between Robinson and Dewey Streets, on the 6100 block of Market. There are ten parcels, currently with several vacant and dilapidated buildings. Four of the buildings will be renovated and five new buildings will be built, three facing Market Street and one each on Robinson and Dewey Streets. 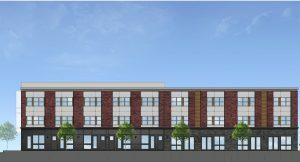 Each Market Street building will have three rental units, and the two side street buildings will be single family homes. Commercial retail spaces will be on the first and lower floors on Market Street. In all, the development will have 31 residential units, including the two single family homes, and 4,400 square feet of commercial retail space. There will be some open space behind the Market Street buildings and green roofs on top. Because of the site’s proximity to the 60th and 63rd Street El stations, there is no parking but there will be bicycle storage. The exteriors will have black brick on the lower level and red brick above, with modern, metal panel bays replacing the original bays, and a new cornice. The 60th Street corridor is steadily improving. At the intersection of 60th and Market, a new commercial and residential development is being built by Achievability, older commercial buildings are being renovated along 60th and Market Streets, a landmark apartment building was renovated on 59th Street, and an old movie theatre is being converted into a community center at 60th and Locust Streets. But, the new development at 6117 Market Street brings the corridor into a new era of private development. Looking to invest in the area? Give us a call at 215.692.6636 or email info@thecondoshops.com.